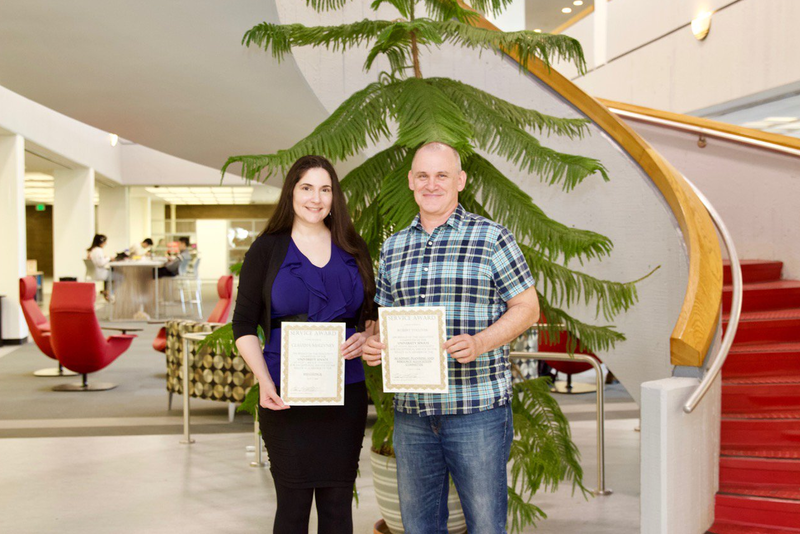 Librarians Claudia McGivney, Head of Academic Engagement, and Bob Tolliver, Head of Science & Engineering, were recently recognized for their outstanding service to the Stony Brook University Senate committees. Claudia McGivney serves as a library representative on the SPD Council, which consults and advises with the Dean of the School of Professional Development on all aspects of the SPD program. Robert Tolliver serves as the library representative on the Academic Planning and Resource Allocation committee (CAPRA) which reviews budgetary procedures and priorities for planning and resource allocation in the Presidential, Provostial, and Vice-Presidential areas and consults with University Administration on proposals for new colleges, schools, and inter-collegiate programs, or the elimination, diminution, or combinations of colleges, schools, or other academic units. Congratulations to Claudia and Bob for their awards!